The exhibit opened in The Box Gallery on First Friday, June 2 and will run through July 28. 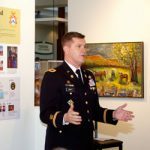 The exhibit is part of the CGSC Foundation’s “Art of War Initiative” which is a project designed to preserve, promote, and protect the life and longevity of the art and gift collection that belongs to the U.S. Army Command and General Staff College at Fort Leavenworth. Foundation CEO Doug Tystad presents Art of War challenge coins to Commerce Bank Chairman Jonathan Kemper, left, and Box Gallery Director Robin Trafton, right. Guests at the reception mingled and viewed the items on display, including the Corinthian helmet, which is the gift upon which the Art of War Initiative logo was based. The helmet was a gift presented to CGSC by Chief of Hellenic Army General Staff Lieutenant General Manoussos Paragioudakis who served as chief of the Greek Army from 1999-2002. The general was a graduate of the CGSC Class of 1982 and was inducted into the CGSC International Hall of Fame. The significance of the helmet to the Art of War Initiative is that while it was created as a tool of war in a bygone era, it became a piece of art in an archeological sense, and then became a gift of peace between two allied nations when the Greek general presented a replica of it to the College. During the reception, Foundation CEO Doug Tystad welcomed the group and provided background information on the collection and the initiative. 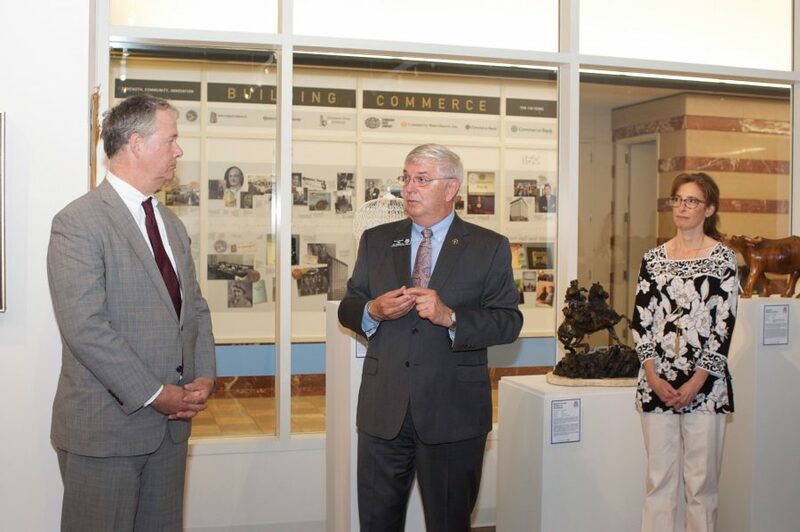 Tystad presented Art of War challenge coins to Jonathan Kemper, chairman of Commerce Bank, and Robin Trafton, director of The Box Gallery, for their extensive work in supporting the Art of War: Gifts of Peace exhibit. Commerce Bank funds the gallery operations. As he received his coin from Tystad, Kemper commented “this is exactly the type of exhibition for which we opened the gallery.” The Box Gallery attempts to reveal Kansas City’s cultural arts and unique history and surprisingly enough for some, CGSC and Fort Leavenworth are a part of that. 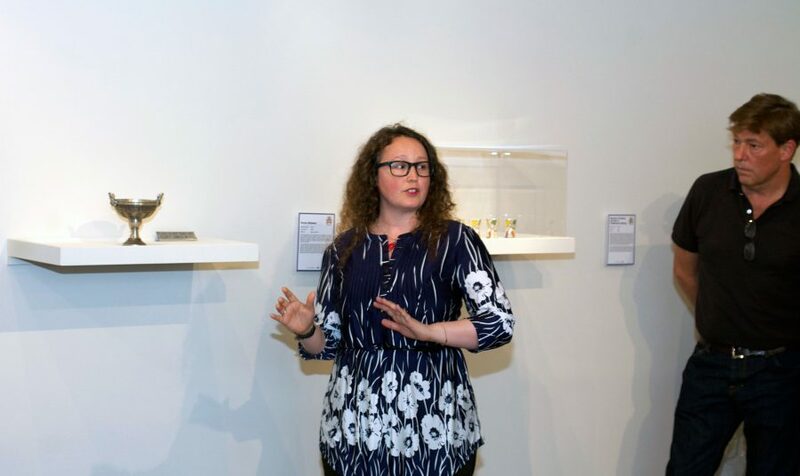 Poppy Di Candeloro, an independent curator and researcher with the Todd Weiner Gallery, discusses one of the items on display. Todd Weiner, owner of the gallery in his name, also spoke for a few minutes about the art and gifts on display and Meghan Dohogne, assistant gallery director, and Poppy Di Candeloro, an independent curator and researcher with the gallery, each discussed some of the items on display. 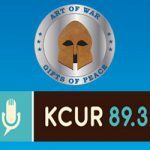 Other events are also scheduled during the “The Art of War: Gifts of Peace” exhibition. On June 22, from 5:30 – 8 p.m., The Box Gallery will host a discussion panel titled “Lessons on Leadership” featuring a panel of military and business leaders. On July 13, from 5:30 – 8 p.m. the Gallery will host “Reflections,” a poetry reading featuring local poets, including a poet with a military background. For more photos from the reception see the CGSC Foundation Flickr photo album.